North Harbour and Auckland Blues' Anthony Boric has forced his way into World Cup reckoning despite carrying an injury into the 2011 Tri-Nations. He made his debut for the All Blacks in June 2008 having impressed for the Blues. His first apperance was a replacement against England. And he crossed the line for his first try against Scotland on their tour of the northern hemisphere in November 2008. Boric failed to hold down a regulard first-team spot in the All Blacks side throughout 2009 and 2010 though continued to be in the selection mix. And he marked his start against Ireland on the tour of the northern hemisphere with a try. 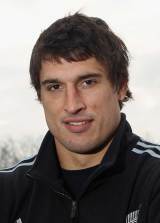 Boric was selected for the All Blacks' 2011 World Cup campaign and appeared in four of the matches as New Zealand were crowned World Champions.